Theresa May is meeting European leaders and EU officials on Tuesday for talks aimed at rescuing her Brexit deal. 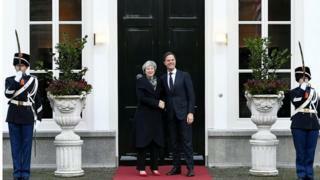 She is holding talks with Dutch PM Mark Rutte and Germany’s Angela Merkel after postponing a Commons vote on the deal. The UK PM has said she needs “further assurances” about the Northern Ireland border plan to get backing from MPs. European Commission President Jean Claude-Juncker said the EU would not “renegotiate” the deal but there was room for “further clarifications”. The prime minister is understood to be seeking legal guarantees that the UK will not be trapped in the Northern Ireland backstop plan indefinitely. Critics object to the backstop – a temporary customs arrangement designed to prevent the need for checkpoints at the Irish border if a long-term solution that avoids them cannot be agreed – because it imposes different regulations in Northern Ireland from the rest of the UK. They also object to the fact that under the terms of the withdrawal agreement, the UK can not exit the backstop without the EU agreeing. What is Theresa May asking for? Commons leader Andrea Leadsom said Mrs May was seeking to give the UK Parliament a vote on whether to enter the backstop – and an annual vote on whether the country should remain in it. She told BBC Radio 4’s Today programme this could be done in an “addendum” to the withdrawal agreement, without changing the main text of it. Asked if this would be enough to satisfy critics of her deal, she said Mrs May was “absolutely determined to get a deal Parliament can vote for”. What next for the vote on deal? MPs have to give the go-ahead for Mrs May’s deal if it is to come into effect when the UK leaves the EU on 29 March. But the PM did not a set a date for the issue to return to Parliament in her Commons statement on Monday. But he said there was “room enough to give further clarifications and further interpretations”. 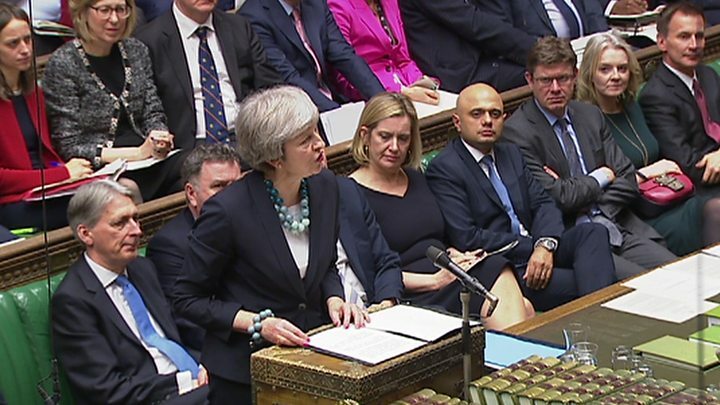 It is not clear if that would be enough to win over Conservative Brexiteers and the Democratic Unionist Party, whose votes Mrs May relies on to win key votes in the Commons, who have called for the entire backstop plan to be dropped. Andrea Leadsom said the prime minister had decided to pull the vote on her Brexit deal “at the last minute” after speaking to cabinet members on Monday morning on the phone. Her U-turn sparked anger among MPs, who had spent three days debating the deal and had been promised the final say on it on Tuesday. Labour leader Jeremy Corbyn said Mrs May had “lost control of events” and a number of Tory MPs called for her stand down, saying she had lost all credibility. More backbench Tory MPs are considering submitting letters of no confidence in the prime minister in the hope of toppling her and forcing a Tory leadership contest. So far 26 MPs have publicly said they have written such letters – 48 of them are needed to trigger a vote. Separately, Labour is coming under pressure from the SNP and Lib Dems to call a vote of no confidence among all MPs – something only the main opposition party can do. It could lead to a general election being called – giving the public a say on who the next prime minister should be, rather than just Tory MPs. Labour want to force a general election but they have said they will not call a vote of no confidence at this stage and will wait until the prime minister holds the Commons vote on her deal, when, they say, it will stand more chance of success. However, Labour will seek to keep the pressure on the PM in an emergency debate in the Commons later on Tuesday – which was granted after the decision to call off the vote on the Brexit deal.